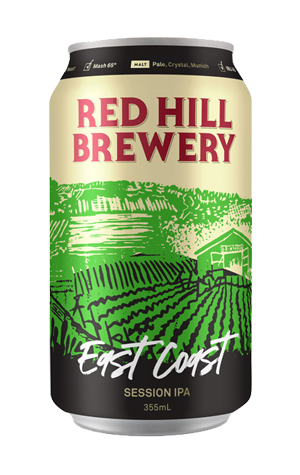 One of the first two cans to be released by Red Hill, the title can be read as a nod to their Mornington Peninsula home and the easier-drinking IPAs from the US. Floral hops and a little spruce, from the use of Cascade hops, lead off on the nose in a beer that leans more towards the "session" than the "IPA" stamped on the cans, both in terms of punch and bitterness, with the latter of the drying, slowly building and faintly resinous variety. Taken as a pair with the Two Bays, you could almost tag the pale ale as a session ale and this beer as a pale in the landscape into which they've been launched. Which, given they're designed to be beers drinkers go back to for more, is no bad thing.